RMS: Ray Russell, Mo Foster, and Simon Phillips – three musicians who know that the only true accolade is the admiration of one’s peers. Whether in the studio or on tour they have, between them, worked with major artists as diverse as Jeff Beck, Gil Evans, Stanley Clarke, The Who, Tina Turner, Phil Collins, Jack Bruce, Gerry Rafferty, Cat Stevens, Joan Armatrading, and Georgie Fame. In addition all three of the musicians have recorded successful solo projects. 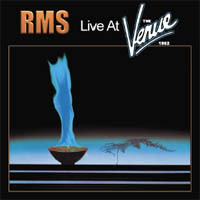 Peter Van Hooke – a friend, and a long-serving drummer with the Van Morrison band – suggested that RMS would be perfect for his newly formed MMC label. Pete decided to promote the launch of the label with a concert at The Venue, a theatre near Victoria Station in London. The line-up for the evening – a reflection of his catholic taste – was RMS plus ex-Bonzo Dog Band singer Neil Innes. This was the first-ever live gig for RMS and prior to the event the band plus the horn section rehearsed for two days at EZEE Hire, a facility in north London. Any nerves the band may have felt prior to the show soon evaporated when the audience displayed their warmth and enthusiasm. The evening was a total success. This album, which has remained unheard until now, is dedicated to the memory of Ronnie Asprey – a delightful friend, and a beautiful player.